Patricia Tang performed on NPR’s From the Top with Host Christopher O’Riley, Show 301, as part of the Cambiata String Quartet, recorded in February 2015. 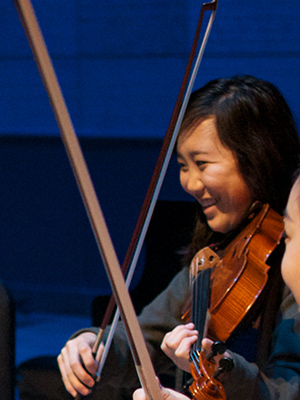 The Cambiata String Quartet is coached by Aenea Keyes at the San Francisco Conservatory of Music. Its members include: 16-year-old cellist Elena Ariza from Cupertino, California, who studies with Eric Sung; 16-year-old violinist Tsutomu William Copeland from Palo Alto, California, who studies with Wei He; 16-year-old violinist Raymond Sofrom Saratoga, California who studies with Davis Law; and 17-year-old violist Patricia Tang from Palo Alto, California, who studies with Susan Bates.